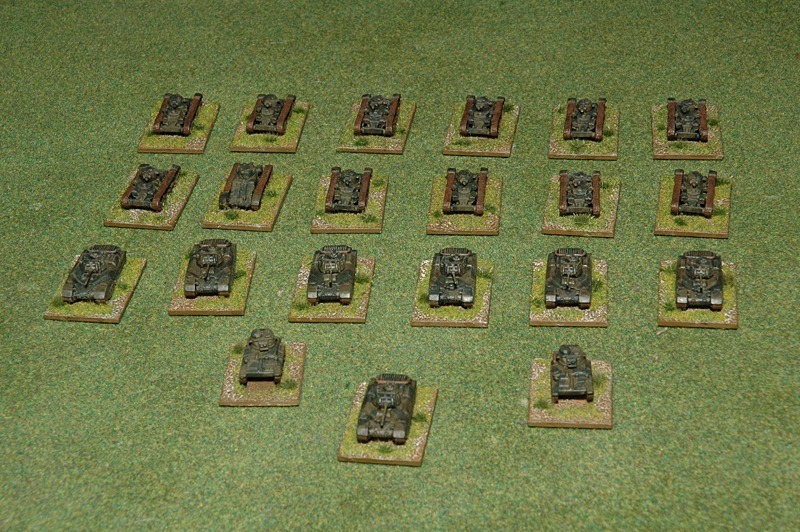 That’s 7th Battalion Royal Tank Regiment for Battlegroup Panzergrenadier. An HQ of one Matilda II and two Mark VIBs a squadron of six Matilda IIs and two squadrons of Matilda Is. HQ – Matilda IIs (BR103) and Vickers MkVIbs (BR106) from Pendraken. Matilda Is (Pendraken BR127) I must confess that this is not my favourite Pendraken model, the sculptor seems to have missed the sag in the top of the tracks which is seen in most photographs of the Matilda I. Take a look at this picture of a restored Matilda I in action. Previous story What on Earth?